New digital restorations are the main attractions for four titles that will be arriving via the Criterion Collection in November 2017. 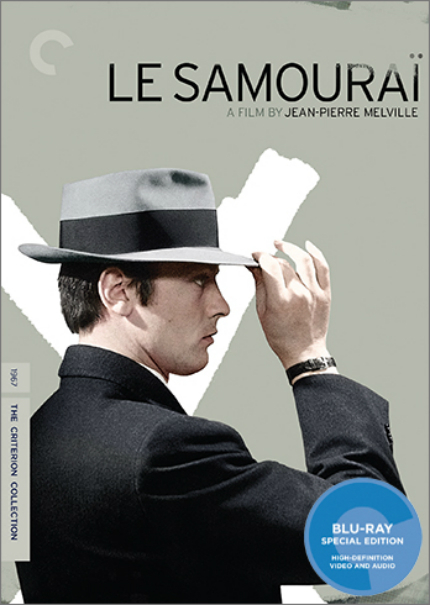 Le Samourai is the one that caught my eye first. Jean-Pierre Melville's work has been influential upon more than generation of filmmakers fascinated by the crime genre, and his 1967 drama is visually striking and emotionally chilly; Alain Delon stars. It will be presented in a new high-definition digital restoration. Desert Hearts is a profoundly affecting love story. Groundbreaking in 1985 for its frank depiction of the attraction between two women in the 1950s, I've only seen it on a lower-resolution version, so I'm very interested in seeing the new, restored 4K digital transfer, especially since it's from the early period of acclaimed cinematographer Robert Elswit, who's become known for his work with Paul Thomas Anderson, including the Academy Award-winning There Will Be Blood. Jabberwocky marks the solo directing debut of Terry Gilliam (Monty Python). Dating back to 1977, it was a film I managed to miss multiple times when it played in theaters, so a new 4K restoration should hit the mark. It's making its first appearance on Blu-ray. Last but not necessarily least, The Phildelphia Story may be best known nowadays for its notorious, face-pushing opening scene between Cary Grant and Katherine Hepburn, which may dissuade some from watching any further. As directed by George Cukor, it proves to be an affecting tale of romance lost and gained, and features a lovely performance by James Stewart. Criterion's edition will feature a new 4K restoration. Visit the official Criterion site for more information. Come November, look for our reviews of some, if not all, the releases.